Worthing striker Omar Bugiel has joined National League Forest Green Rovers on a deal until next summer. 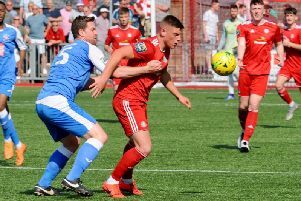 The forward helped Worthing win promotion from the Ryman League South Division last season and has been in outstanding form in the Premier Division this season, scoring 15 league goals. There had been a lot of interest in Bugiel in the past few weeks and he has now joined Forest Green for an undisclosed fee. He could make his debut for the National League high-flyers against Boreham Wood tomorrow. Bugiel said: “It is a higher division so I’ve got to prove myself. I’m definitely going to give 100 per cent. “I’m going to be working my socks off – I’ve always been like that – work rate is the main thing. If it doesn’t go your way you’ve still got to work hard. It only takes one chance to score a goal. Worthing have brought in striker David Ajiboye on loan from Brighton & Hove Albion until the end of the season.